Pen and ink drawn on Crossgen bristol board. 10 3/4" x 16 3/4". 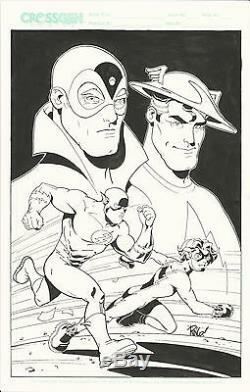 The image features Flash and Impulse (who was created by Wieringo and Mark Waid) with the original Flash (Jay Garrick) and Max Mercury looming behind them. The art is not dated, but because it is on Crossgen paper, I suspect it is from 2001 when Wieringo was penciling and inking for Crossgen. The item "Mike Wieringo original Flash and Impulse art" is in sale since Wednesday, February 01, 2017. This item is in the category "Collectibles\Comics\Original Comic Art\Drawings, Sketches". The seller is "teamgiganticus" and is located in Houston, Texas. This item can be shipped to United States.